In some wasy the ski universe is passing Peter by. All anyone and everyone is focused on is the next best powder ski with Rocker. Peter is a dinosaur, with racing carving background and his perrenial focus on skis that will perform at a high level on hard groomed snow. It is not his fault that most of the people buying skis today cannot lay down a clean set of arcs on hard snow. He has tried to adapt but his true colors and knowledge base is in skis that will carve well. In 20 years it may be lost art!! are you speaking of yourself or Peter? nothing wrong with being a race/carve oriented skier at all. I don't think it makes him a dinosaur. You should give more credit to the skill level of the slackcountry and Bc skier in powder and soft snow using modern ski technology and skill sets. I won't argue that many can't carve a turn but I would argue that most of those who do carve turns, don't know to ski trees or have the varied skills necessary to ski off-piste (off-piste does not mean side of trails or ungroomed snow) in varied terrain, most don't know how to read terrain properly understanding where snow deposts, settles; where it's safe and such. Most won't ski into rocky irregular terrain and ski it well, take small jumps, how to put on a ski in deep powder or steep lines.? I have a lot to learn and will continue to work on skills which will include taking an AVI 1 course this season (hopefully) and start on my skinning and hiking skills. Although I am not a park fan, I respect the skills that are required to ski off a 40' booter or slide down a rail or pipe.? Its all good and I respect those who prefer it but you should consider new skills, technologies and different ways to explore and ski the mountain. to many, great skiing encompass's mountaineering skills including how to navigate and read the mountain to find the goods. 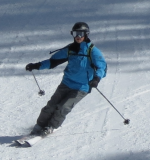 In many ways a great skiier may not have perfect form but can ski any terrain in control with confidence and speed. If a rockered ski helps them accomplish this, so be it.? If we could all ski 60-80 days we could all have much greater skills but the reality is that the average skier is still skiing on a groomed run 7-9 days per season.? I have been finding more pleasure in finding quiet areas in the slack country or BC (like in Chile) where it may take a mix of walking, skinning or traversing to. The complete "emptyness" of skiing down a tree'd area or into a untracked meadow is what it's about to me. That's my skiing.? I respect the skils of a racer or that someone may like groomed skiiing and I understand that there are specific needs to that kind of skiing, I don't trash it or consider it inferior. I am not defined by skiing.? ? ? I just re-read my post. I don't see where I am trashing anyone. What I said is that the industry has changed and that what most skiers care about is skiing powder wth rockered skis and that most skiers can't carve arcs. I think you could have said that most skiers can't carve arcs ten years ago and it would still have been true. My only point is that carving is no lonegr a focus area for most skiers. I don't think I put a value judgement on it. It's niether good or bad, it just is. As for racers and their skills, I disgree that they can't ski off piste. Go look at Darren Rahlves free ski. In fact most of the best extreme skiers are all ex racers. Racing will not teach you how to do flips in the air, everything else that one needs off piste and in extreme terrain these guys have in spades. As well, the really good skiers that I know that can arcr rocking turns also ski off piste quite well. My good friend Thor Kallerud skis off pste maybe once a year, but he slays bumps and extreme terrain because his balance is always perfect and he uses his edges to perfection all the time. if you weren't looking as this kind of skiing be beneath carving, you wouldn't have said "its not his (peters) fault", by stating this, you have said its the fault of others, which in this case is people who ski on rockered powder skis and dont value carving skills. Its OK. you have worked very hard on the skills you value and are most drawn to. AS far as racers go, darren ralves is a bit of strecth eh? He is in the elite of elite, there are most likely no sports he could not master easily. Balance is key and is a trait found in all atheletes, its not a skill set reserved for any speciific sport. BTW- I don't consider bumps off-piste skiing but they do require a great degree of skill. If I took thor into the backcountry and only let him use his edges, he might not make it out..... if you can't use your poles for offensive, defensive or bracing you are in big trouble. again, I am sure Thor is a fantastic skier who is extremly talented who could adapt his skill sets for that kind of skiing. I happened to stumble across the movie about Kye Peterson where Glen Plake and some others took him under their wings and helped him grow to the point that he could ski the same slope that his father (Trevor Peterson) died on. ?Until I saw that movie, I didn't realize how much mountaineering was part of their "bag of tools" to include reading the snow and the snow pack, where to traverse, where to rope up, where to belay each other while starting down, etc. Ron, what I meant by saying "it's not Peters fault" is that his reveiws have become less relevant because the focus of skiers and the industry have moved elsewhere. Again there is no value judgement here except in youir mind. Jim, I own a copy of The Edge of Never. I think this is one of the best ski/mountaineering movies ever made. It is a very powerful and touching movie with some great shots of Chamonix and some hellacious couloirs that are being skied. For those that haven't seen it, iit's good one to put on the netflix list as you get yourself psyched for ski season. I think there is some miscommunication here. Change the term "carving ski" to "on piste" or "a ski with hard snow capacity" and see where the conversation goes. IMHO a ski that is going to win "Ski of the year" has to excel (or be at the top) in a multitude of categories and could be applicable as a "one ski quiver". A ski like the Chariot could win a segment like "specialty" or "Boutique" ski of the year. but overall? No way. Phil: Is is possible for a ski to be at the top in a multitude of categories and for a wide variety of skiers?? Or by the very nature of the compromises involved, will any ski designed to be versatile be very good in multiple categories but never excel.? Is is possible for a car to excel on the race track and still haul the kids to soccer practice for a wide variety of drivers.? I just noted in his introductory paragraph and underlined the word handles, as opposed to excelled.? I think the Ullr's Chariot excels in only one thing, and that is versatility with regards to ski terrain and to type of skier that can use the ski. If not the most versatile ski we have ever tested, it is certainly in the top ten. This may be the elusive "universal" ski. The ski handles deep snow, crud, chop, hard snow, speed and reasonable bumps with ease; always reliable, never unpredictable or difficult to handle. 1. What woould be your "ski of the year" selection based on your criteria as listed above. ?? 2. What would be your 1-ski quiver recommendation for me for skiing in Utah and Colorado? Add to that..for universal conditions and terrain. I cannot see the Chariot excelling under his parameters as an eastern ski. In playing with the ski at the ski show, I can get a pretty good idea how a ski will react on snow and where it would be good. I think it is ironic that Realskiers does a vast amount of testing that will provide hard numbers then the winners listed are subjective? Example, IIRC, last year the FX84 was the first ski ever to get 5 stars in EVERY category, yet didn't win ski of the year? If there was only ONE ski that I could ski for the whole season. East/West/Soft/Hard. Without thinking would be the MX88, now it is not an inexpensive ski, but it is worth it. If it came down to budget and staying within MAP parameters (not leftovers or pro deals ect). Blizzard 8.7. But an argument could be made for another dozen skis and all would be accurate. Personally, If I was King of the "Ski Review world" I would do things differently. No, I am not going to share my ideas..at this point. MX88 was 7 out of 8 5's with a 4, Phil is right that the FX84 was all 5's. But as a family, Kastle has more 5's per ski than any other brand. A universally high-rated ski. But as a family, Kastle has more 5's per ski than any other brand.? A universally high-rated ski. Again with results like that, why aren't these skis winners? Why bother posting numbers if the results are subjective. However, it seems that he likes the Contact 4x4 better than the MX88, even though "the numbers" are lower.